Item includes two copies of the performance notes. The first copy does not include instructions for Part 3, page 3 and the second copy rectifies this error. 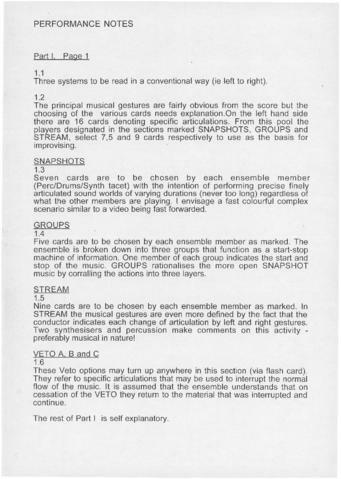 The performance notes include instructions for each of the seven sections of the piece; a description of the composition; and diagrams of the orchestra and percussion performance layouts. MS-5-16, Box, Folder contains a letter from Barry Guy to Jeff Reilly regarding corrections to the performance notes.